Hey all! I’ve decided that it’s high time for a smoky eye tutorial on this blog. Unfortunately I don’t actually get out all that much, so when I finally had an opportunity at my going away party, I decided to take pictures of the more dramatic eye makeup for the evening. I don’t do smoky eyes during the day because I find them too intense, but this look hung on all night and was pretty fabulous. Read on for details on the makeup! I used my Naked3 palette again for this one, but before you get salty about it, know that my resources were limited from moving. I also think it is realistic to think that a regular makeup user has one big palette to use tops so it isn’t that crazy. I started by putting some tape on my eyes starting from the bottom lash line and angling up next to my eyebrow’s end. I only use this strategy when I’m doing a bold look and need a little extra help keeping it neat. I would recommend putting the tape on your wrist first to reduce stickiness and keep from hurting your eye skin. I put the color Mugshot all over my lid and then Darkside in my crease to begin. Mugshot is a pretty shimmery brown and Darkside is a matte gray. The true smokiness in this look is created by the color Blackheart, which I put in my outer corners. When working with a very black color like this one, I would recommend going very slow and patting in a little bit of color at a time. I used Darkside to blend the places where the black was too harsh and then added more color in the center parts. The tape helps a lot with fallout in this step. Next I added a black winged eyeliner to pull the look together. The tape really helps during this part to keep the eyeliner looking flawless. I took the tape off after this part and as you can see, it leaves an almost unnaturally neat line. For the final step I used a clean brush to smudge the outside edges and make the line less neat. I also added the color Strange in the inner corners and as a brow highlight. Finally I added a nice thick coat of mascara. You might need to dab a bit more of the original eyelid color on at the end in case it was blended away. After that you have finished the look! 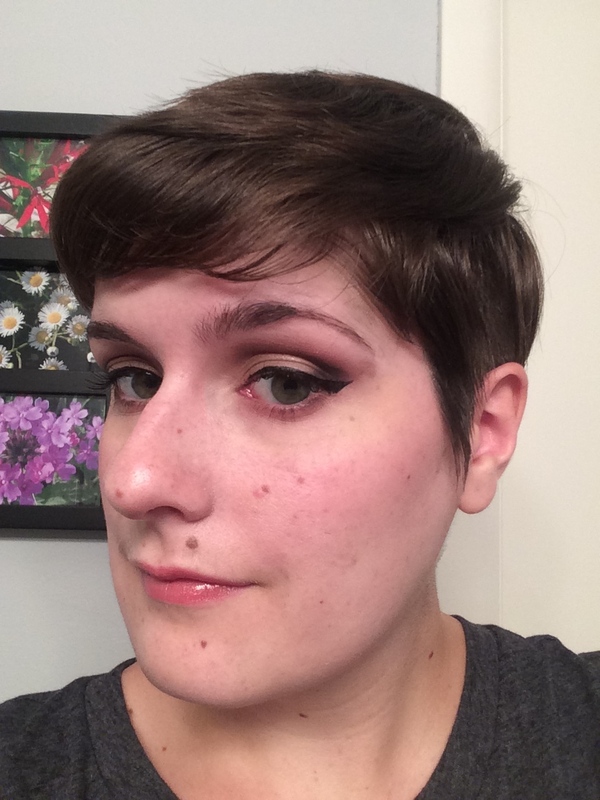 I finished my face with a more intense blush because the dark shadow can leave you looking a bit dead. I used the Tarte Amazonian Clay Blush in Blushing Bride. I used my MAC Viva Glam V for my lipstick as the final touch. I hope this tutorial helps you construct your best smoky eye for a night out! It is definitely easier than you think. Remember, less is always more with this look! Check it out below! This entry was posted in Tutorial and tagged bold eye makeup, smoky eye tutorial, smoky eyeshadow tutorial. Bookmark the permalink.